Ovarian cancer is difficult to diagnose at early stages. Once it has spread beyond the ovaries, it is more challenging to treat and can be fatal. During metastasis, ovarian tumor cells detach from the primary tumor site and migrate to the abdominal cavity, where their survival is supported by white blood cells known as tumor-associated macrophages. In a recent study, senior author and Yale pathology professor Wang Min demonstrated that the tumors release substances called cytokines to attract macrophages, which then secrete growth factors that promote tumor cell growth and proliferation. 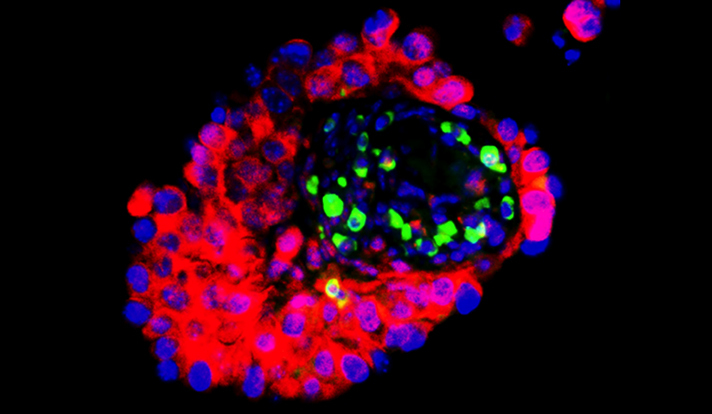 The study reveals a mechanism that provides researchers with a promising target for treating ovarian and other metastatic cancers. Tumor-associated macrophages (TAMs) can influence ovarian cancer growth, migration, and metastasis, but the detailed mechanisms underlying ovarian cancer metastasis remain unclear. The study showed a strong correlation between TAM-associated spheroids and the clinical pathology of ovarian cancer. They also determined that TAMs promote spheroid formation and tumor growth at early stages of transcoelomic metastasis in an established mouse model for epithelial ovarian cancer. M2 macrophage–like TAMs were localized in the center of spheroids and secreted EGF, which upregulated αMβ2 integrin on TAMs and ICAM-1 on tumor cells to promote association between tumor cells and TAM. Moreover, EGF secreted by TAMs activated EGFR on tumor cells, which in turn upregulated VEGF/VEGFR signaling in surrounding tumor cells to support tumor cell proliferation and migration. Pharmacological blockade of EGFR or antibody neutralization of ICAM-1 in TAMs blunted spheroid formation and ovarian cancer progression in mouse models. Their findings suggest that EGF secreted from TAMs plays a critical role in promoting early transcoelomic metastasis of ovarian cancer. As transcoelomic metastasis is also associated with many other cancers, such as pancreatic and colon cancers, our findings uncover a mechanism for TAM-mediated spheroid formation and provide a potential target for the treatment of ovarian cancer and other transcoelomic metastatic cancers.